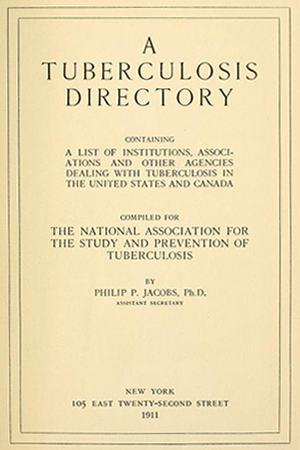 A Tuberculosis Directory by Philip P. Jacobs. After centuries of research tuberculosis (TB) has dropped from one of the leading causes of death in the 19th century to the ninth, worldwide. How did we accomplish this and can we maintain control of the disease in the era of drug-resistant TB infections? There is strong evidence found in skeletal remains that TB has infected humans for the past 9,000 years, and perhaps much farther back3,4. Hippocrates described the characteristics of the disease to be hereditary in nature. Consumption, phthisis and the White Plague are all terms used to refer to tuberculosis throughout history. In the metropolis of London, 1:7 died from consumption at the dawn of the 18th century. By 1750, that proportion grew to 1:5 and surged to 1:4 by the start of the 19th century. The Industrial Revolution, coupled with poverty and squalor, created the optimal environment for the propagation of the disease5. An estimated 1 billion people around the world died from TB in the past two centuries, and the fatalities continue even as we discover new treatments1. According to a 2017 WHO Report, TB is the ninth leading cause of death worldwide and the leading cause from a single infectious agent. In 2016, there were an estimated 1.7 million TB deaths worldwide and over 10 million people became infected with TB. Multi Drug Resistant (MDR) TB is an ongoing issue, with 600,000 new cases of rifampicin-resistant TB (RR-TB). Rifampicin is considered the most effective first-line drug to treat TB. Globally, in 2016, an estimated 4.1% of new cases and 19% of previously treated cases had MDR/RR-TB. Currently, 16% of those with TB will die from the disease. The report details the disproportionate number of deaths in poorer countries, where early diagnosis and treatment are often not widely available. In 2016, about 82% of HIV-negative TB deaths occurred in the African and South-East Asia Regions, while India accounted for 33% of global TB deaths. The good news is the global mortality rate fell by 37% between 2000 and 20163. On a recent visit to the Grant Cottage at Mt. Macgregor, NY — not too far from Taconic Biosciences' headquarters — I learned the site had once housed a sanatorium for those infected with tuberculosis. I was aware the Adirondack Mountains were a haven for those hailing from cities seeking treatment for TB, but after doing some research I found A Tuberculosis Directory, which lists over 500 sanatoriums, centers, and hospitals that cared for TB patients in the United States and Canada. Dr. Robert Koch (of Koch's Postulate) published a paper in 1882 identifying tubercle bacilli to be the cause of TB, for which he won a Nobel Prize in 1905. This discovery led to an understanding of what caused TB and, to some extent, its means of transmission. It did not immediately result in any treatments or prevention, such as a vaccine. So how did the idea to convalesce in the mountain air get its start? There was some thought climate could improve symptoms from TB, but whether that climate was at the ocean, in high humidity, or mountain air was very much debated. Dr. Hermann Brehmer, diagnosed with TB in 1853, went to the Himalayas to seek his cure in the mountain climate. Believing himself cured, he returned to Germany in 1854 to study medicine and wrote a dissertation entitled Tuberculosis is a Curable Disease1. Brehmer established a sanatorium, which grew to 300 beds and claimed good results in the treatment of TB2. In the United States, the sanatorium movement got its start from two doctors who were influenced by the work of Dr. Brehmer and experienced an alleviation of symptoms after spending an extended time living in a mountain region. Dr. Alfred Loomis first arrived in the Adirondack Mountains in Upstate New York in 1867, after receiving his TB diagnosis. After several months, Loomis found that his cough subsided, he gained strength, and put on twenty pounds. Loomis founded the Loomis Sanatorium in Liberty, NY, making it very accessible for those living in New York City. Dr. Edward Trudeau, a younger colleague of Dr. Loomis and also infected with TB, took an extended trip to the Adirondack Mountains and found that he, too, felt better after several months of outdoor activity and eating well. Trudeau went on to establish "cure cottages" at Saranac Lake, NY in 1884, where he required his patients to follow a strict diet and regimen of exercise and outdoor activity. He later established the Saranac Laboratory for the Study of Tuberculosis, known today as the Trudeau Institute. However, even though Trudeau thought he had cured himself of TB, he died of the disease in 1916. The Trudeau Sanatorium closed in 1954 as antibiotic treatment of TB became established. In retrospect, there is very little evidence that breathing mountain air, diet, or exercise had any effect on TB. Most likely, people experienced improvements in heath related to living an improved lifestyle with good food, exercise, and fresh air, but the tubercle bacilli were unaffected and would eventually kill them. Regardless of efficacy, encouraging people infected with TB to move to isolated areas accomplished two things: It removed them from the general population, thereby decreasing the risk they would infect others, and put a high concentration of infected individuals in the same area, allowing for the testing of new cures and treatments. It is generally accepted that Mycobacterium tuberculosis originated from other, more primitive organisms of the same genus Mycobacterium. The beginning of modern scientific understanding of tuberculosis starts with Rene' Laennec, a French clinician working in the late 19th Century. He invented the stethoscope so he could corroborate auscultatory observations of patients with tuberculosis with the lung lesions found during autopsies of those who had died from TB. As with many clinicians and researchers working on TB, he succumbed to the disease6. Gaspard Laurent Bayle published an article in 1810 in which he divided phthisis into six types: tubercular phthisis, glandular phthisis, ulcerous phthisis, phthisis with melanosis, calculous phthisis, and cancerous phthisis. He based his findings on more than 900 autopsies7. As noted earlier, Robert Koch provided the definitive cause of TB. He made his result public at the Physiological Society of Berlin on 24 March 1882, in a famous lecture entitled Über Tuberculose. The lecture was published for wider dissemination three weeks later and is still commemorated as World Tuberculosis Day8. In 1890, Koch developed tuberculin, a purified protein derivative of the bacteria9. While it proved to be an ineffective means of immunization, Charles Mantoux found it was an effective intradermic test for diagnosing tuberculosis in 19087. With the understanding that TB was contagious, clinicians and public officials moved to a containment "plan" in the early 20th century. There were campaigns to deter public spitting. Infected poor people were often pressured to enter sanatoria that were unlike the ones noted earlier. They were more like prisons and did not offer much hope of a cure, let alone treatment to ease symptoms. This all began to change in 1945 when the first TB patient was cured with streptomycin, developed by Selman Waksman in 1943. Waksman received a Nobel Prize in 1952 for his work on streptomycin and its use in treating TB. While some patients responded to streptomycin and cleared the TB bacteria, many others became sick again as the Mycobacterium developed resistance to streptomycin. The development of new TB drugs led to a reduction of resistance. A discovery in the late 1950s found that streptomycin, administered with para-aminosalicylate (PAS) and isonicotinic acid hydrazide (INH), achieved cure rates of 80-90%. However, the side effects and toxicity were formidable, and the regimen required between eighteen and twenty-four months of treatment. In the late 1950s an Italian pharmaceutical company developed Rifampin, first used in clinics in 196610. Current TB treatment continues to center on antibiotics, including Isoniazid, Rifampin and a combination of Isoniazid and Rifapentine for latent TB. For active infections drugs include Ethambutol, Isoniazid, Pyrazinamide and Rifampin. In some cases, personalized medicine is being used to see which antibiotics are most effective against the patient's specific bacterial strain. For drug resistant forms of TB, antibiotics called fluoroquinolones are the first line treatment, as well as injectable antibiotics such as amikacin, kanamycin, and capreomycin13. National Jewish Health, by virtue of being a referral center for the United States, had become the primary worldwide source for treatment and laboratory diagnosis of highly-resistant TB. Their website provides a brief explanation of how this resistance developed: "Other new drugs were discovered in ensuing decades and, by 1990, cure could be achieved in six months. Unfortunately, the human propensity for non-compliance had resulted in rising levels of resistance to these medications. When patients took fewer than the prescribed drugs or dose, the TB bacilli could undergo mutations which then made them drug-resistant." TB resistant to the two major agents, INH and rifampin, were deemed "multi-drug resistant" or MDR-TB. The next layer of complexity were MDR-TB strains which acquired further resistance to important second-line drugs, deemed "Extensive drug resistance" or XDR-TB. The lethality of MDR and XDR took TB back to the status of the White Plague centuries before11. Some of the drugs developed and tried include bedaquiline, delamanid, Pretomanid and Rifampycins and pretomanid, bedaquiline and linezolid in combination. However, all of these have failed in one way or another. They have not brought widespread relief to patients or to the medical community's struggles with TB prevention and treatment12. Animal models play a key role in TB research. 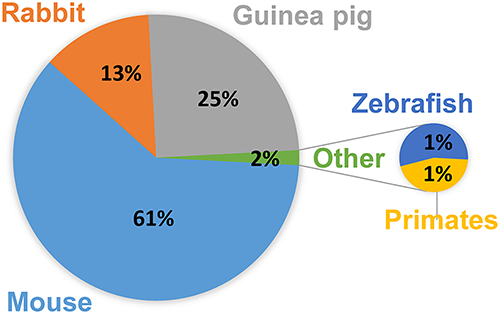 Many animal species are used as TB models with mice, guinea pigs, rabbits, and non-human primates among the most commonly used. Each model mimics one or more features of human TB, including clinical signs, pathological changes, bacteria load in organs, disease progressions, or immunological parameters. Mouse strains used to model Active TB infection include C57BL/6, BALB/c, C3HeB/FeJ, and the C57BL/6 and C3HeB/FeJ strains are also used in Latent TB infection studies14. For a full listing of animal models, with Pros and Cons, see figure 1 from Zhan 2017. In their 2017 publication, Fonseca et al. explain that "mice are preferred model animals for a number of practical reasons, such as availability of immunological-based tools for mice, the existence of genetically modified mouse strains, and the small size and cost-effectiveness of maintaining mice in the laboratory15." With the recent use of gene-editing technologies, including CRISPR, researchers are now able to understand the role of specific genes and proteins in TB infections. As standard or genetically engineered models do not fully reflect the human immune system, researchers are now turning to humanized mice for TB research. Super immunocompromised mouse models such as CIEA NOG mouse® can be reconstituted with human hematopoietic cells and used in subsequent studies. In one study, humanized mice reproduced important features of human TB pathology when infected with M. tuberculosis16,17. While the mice do not fully represent the disease in humans, they have advanced the translational utility of mouse models. TB has infected humans for thousands of years and continues to be a major cause of illness and death, even with the development of effective treatments over the past 100 years. Research into vaccines and more effective treatments continues, however, and we are making progress. According to WHO, in the year 2000, TB was the sixth leading cause of death; by 2016, it dropped to number ten, and TB is no longer among the top ten causes of death in upper-middle and high-income countries. This further emphasizes the need to bring vaccines and treatments to those most in need who live in poorer countries. 1. Koehler, Christopher W. "Consumption, the great killer." Modern Drug Discovery. 2002 5 (5): 47-49. 2. McCarthy, O R. "The key to the sanatoria." Journal of the Royal Society of Medicine. 2001. 94 (8): 413-417. 3. Global Tuberculosis Report 2017. World Health Organization. 4. Hershkovitz, Israel; Donoghue, Helen D.; Minnikin, David E.; Besra, Gurdyal S.; Lee, Oona Y-C.; Gernaey, Angela M.; Galili, Ehud; Eshed, Vered; Greenblatt, Charles L. "Detection and Molecular Characterization of 9000-Year-Old Mycobacterium tuberculosis from a Neolithic Settlement in the Eastern Mediterranean." PLoS 2008. PMID 18923677. 5. Chalke, H.D. Some historical aspects of tuberculosis. Public Health 1959 Dec; 74:83-95. 6. Daniel, Thomas. Pioneers of Medicine and Their Impact on Tuberculosis. University of Rochester Press. 2000. 7. Madkour, Monir. Tuberculosis. Springer. 2003. 8. Yancey, Diane. Tuberculosis. Twenty-First Century Books. 2008. 9. Magner, Lois. A History of the Life Sciences. Taylor and Francis. 2005. 10. History of TB drugs - PAS, Streptomycin, Waksman. TBFACTS.org. 11. Tuberculosis: History National Jewish Health. 12. New TB drugs, TBFACTS.org. 13. What's the Treatment for Tuberculosis? WebMD. 14. Zhan L, Tang J, Sun M, Qin C. Animal Models for Tuberculosis in Translational and Precision Medicine. Frontiers in Microbiology. 2017;8:717. doi:10.3389/fmicb.2017.00717. 15. Fonseca KL, Rodrigues PNS, Olsson IAS, Saraiva M. Experimental study of tuberculosis: From animal models to complex cell systems and organoids. PLoS Pathog. 2017. 13(8): e1006421. doi.org/10.1371/journal.ppat.1006421. 16. Calderon VE, Valbuena G, Goez Y, Judy BM, Huante MB, Sutjita P, et al. A Humanized Mouse Model of Tuberculosis. PLoS ONE. 2013. 8: e63331. pmid:23691024. 17. Heuts F, Gavier-Widén D, Carow B, Juarez J, Wigzell H, Rottenberga ME. CD4+ cell-dependent granuloma formation in humanized mice infected with mycobacteria. PNAS. 2013. 110:6482-7. pmid:23559373. Loomis the Man, the Sanitarium, and the Search for the Cure by John Conway. 2006. A Purple Mountain Press. A Tuberculosis Directory by Philip P. Jacobs. 1911. National Association for the Study and Prevention of Tuberculosis.